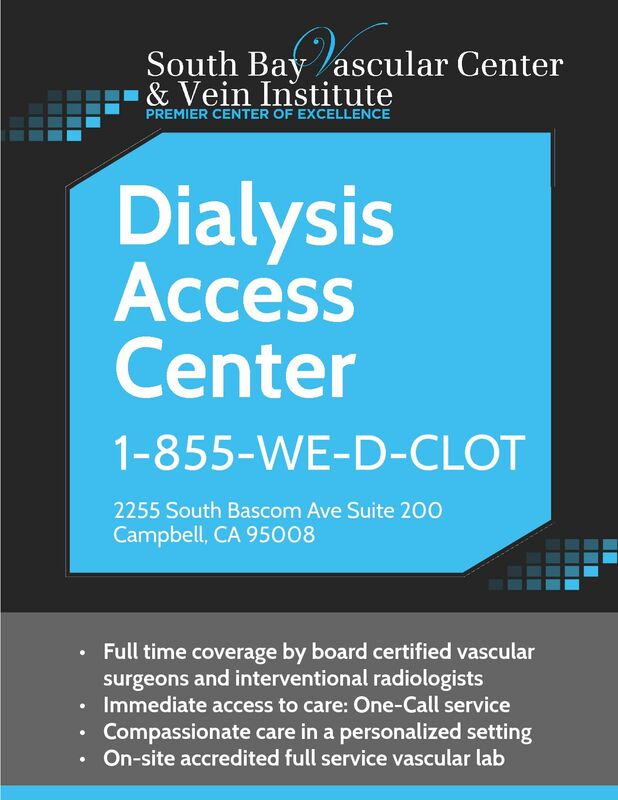 South Bay Vascular Center and Vein Institute is proud to announce the opening of the only dialysis access center in Santa Clara County and the South Bay region with full time vascular surgery coverage. The new center provides experienced care in a state of the art facility conveniently located in Campbell, CA. Trusted local physicians provide compassionate care in a personalized setting. Full time vascular surgery coverage by board certified surgeons enables immediate access to care unlike any other facility in the region. From the most complicated dialysis access problems to the most basic access issues our full time vascular surgeons provides an entirely different level of care and treatment than found in other facilities staffed by interventional nephrologists. Full time Vascular Surgery coverage ensures the best results in the least amount of time; no more waiting in the cold corridors of a traditional hospital; no more secondary referrals; and equally important, a lower cost alternative to the current model of patient care. Most importantly, when you have a problem, we are here to help. South Bay Vascular's new facility is staffed by local physicians and surgeons who have been dedicated to treating South Bay patients for over 60 years. We are local physicians and not a large corporation staffed by out of town physicians. We are dedicated professionals passionate about patient care and who have long track record of success in the Santa Clara Valley. Our new center is a welcome alternative to the traditional hospital setting and provides un-matched access to board certified vascular surgeons trained to address any vascular access complication.